Flix is a Cinema Listings application for Windows Mobile, working in the UK, FR, DE, ES, IT, US/Canada, Australia ! - Call cinema direct from the app. - Movies list cast info, Synopsis, runtime, and (optionally) a poster if Yahoo has one. -The first time you run Flix, you will be taken to the config screen. -Enter either your postcode or town in the location box. -Where Am I will use GPS to find your postcode. -Tick posters if you want posters to be downloaded with movie info. -Movies will list all movies in the database. -Cinemas will show all movie theaters in the database. 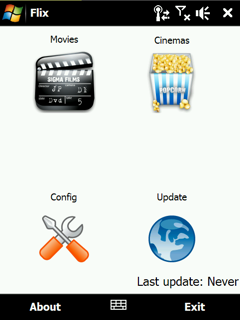 -On either Cinemas or Movies page, clicking the "clock" icon will go to showtimes.